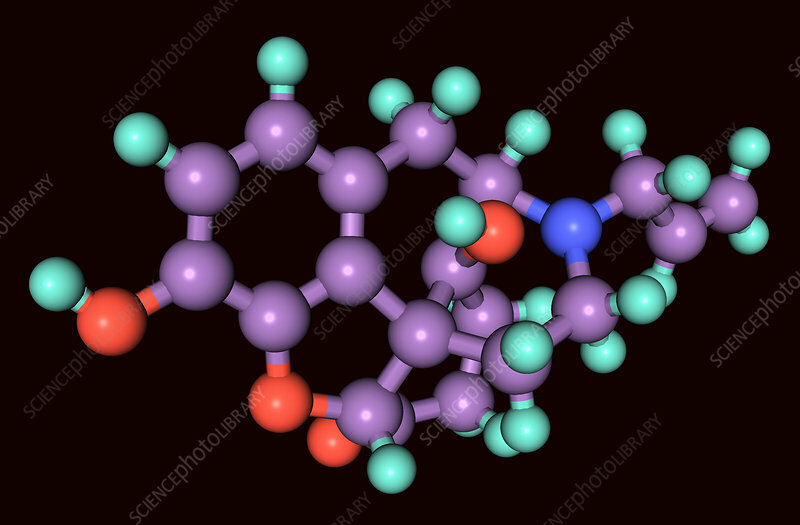 Molecular model of Naloxone (another brand name Narcan), a medication used to reverse the effects of opioids, especially in overdose. When given intravenously, Naloxone works within two minutes, and when injected into a muscle, it works within five minutes. The medication may also be used in the nose. Its effects last 0.5 to 1 hour. Multiple doses may be required, as the duration of action of most opioids is greater than that of naloxone. Administration to opioid-dependent individuals may cause symptoms of opioid withdrawal, including restlessness, agitation, nausea, vomiting, a fast heart rate and sweating. Naloxone is a pure opioid antagonist. It works by reversing the depression of the central nervous system and respiratory system caused by opioids. Formula: C19H21NO4. Molecular mass: 327.38 g/mol. In this image, Carbon: grey; Hydrogen: cyan; Nitrogen: blue; Oxygen: red.